I think I finally finished my inlay journey. See previous attempts here, here and here. I made two different wooden projects with inlay, and aside from leaving out one important step, they turned out well. The projects are my the “Cube Sweet Cube” signs that I have attempted to make over and over again, and a baseball bat trophy thing for my little cousin. He is into tee ball, and has some game winning balls to display. I milled out a deeper pocket (0.05″) and instead of filling it completely with paint, which didn’t go well, just tried to coat the inside surfaces with paint. Thinning the acrylic with a little water helped it coat evenly. The results were pretty good, the color was consistent, there wasn’t a voiding issue, and the surface planed clean really quickly and easily. This was due to the very thin layer of paint on top. The only thing that went wrong was a little bleeding into the grain. It is worse on the red than the black. The oak didn’t do this as bad as the pine did. I was lazy and didn’t do any sealing, so I only have myself to blame. No we know that is important! Mill text pocket with either flat or round bottom mill to at least 0.05″ deep. 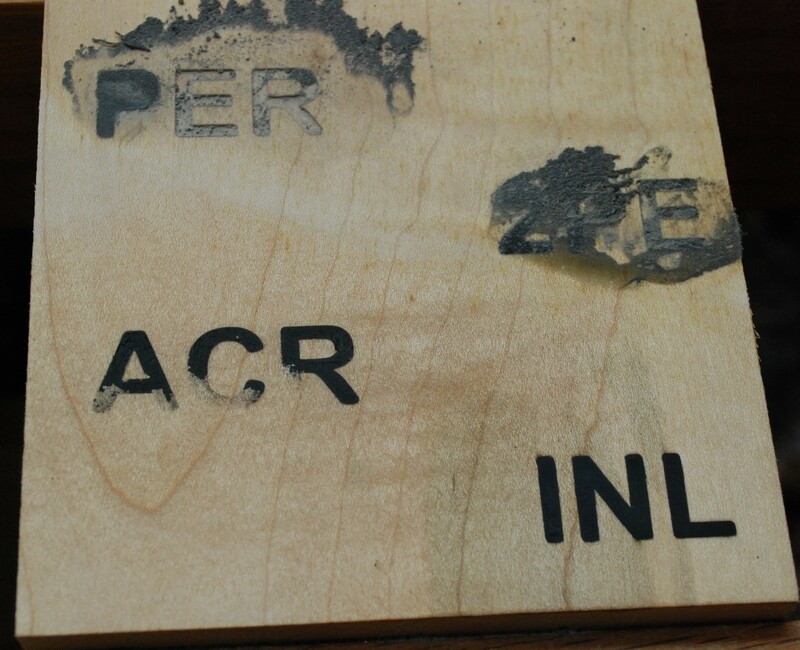 Spray area with a sealer such as spray lacquer. It is cheap and dries quickly. Mix desired acrylic paint color with a small bit of water to make it spread easily. Let dry overnight and either sand or plane off excess paint on top. I used the shapeoko to mill out the somewhat complex area around the handle. I could have cut this with drill bit and band saw, but this was quick and came out really well. I don’t have enough travel to do the whole thing, so I finished the rest of it with my bandsaw. 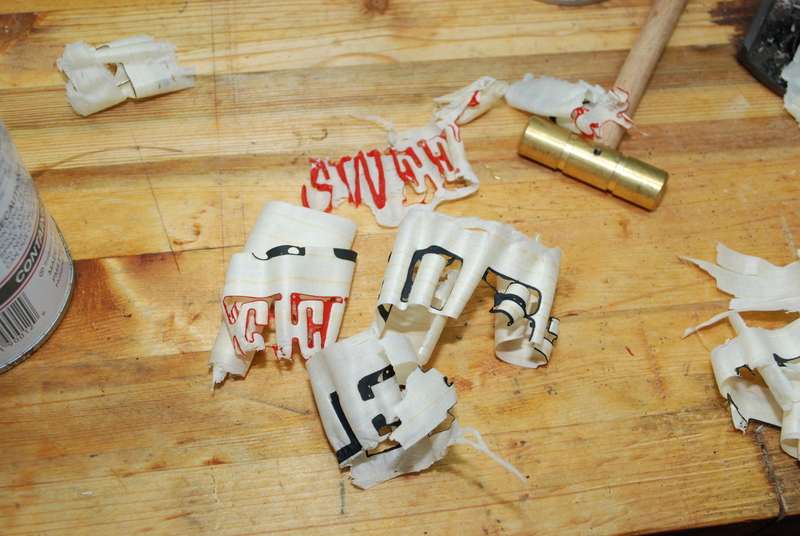 A forstner bit made pockets for holding the balls, and a quick trip around the router made a nice round over. Inlay is going to turn into a saga If this keeps up! I had previously tried doing my own alternative to inlace’s resin infill material. It was kind of a disaster. The dye I added had a very adverse effect on the two part epoxy and resin. A few weeks later I looked at the casting dye and noticed that it had completely separated. There are no instructions on the bottle to mix before use, so it isn’t 100% my fault. I remember last time that I had to add a lot of the stuff to color the resin, and It still wasn’t very opaque. That could have been my issue all along. I created another test structure and went to work. I don’t need to revisit inlace, I know it is good. For the acrylic paint, I tried to slop it on really thick so when it shrinks the pockets will still be filled. The two part and polyester resin were done with a minimum amount of dye added. This time they looked proper dark. The results were unfortunately bad. The polyester resin didn’t adhere well, and the two part epoxy had kind of a rubbery feel to it. Well acrylic it is then! I went a little deep with the sanding and buzzed off part of the R, but other than that It looks good. Without further thought I ran off to make the “Cube Sweet Cube” sings I wanted to make weeks ago. The results were not issue free. The acrylic paint shrinks considerably when it dries. The shrinkage is difficult to predict and often includes bubbles. I was trying to go thin on the pocket milling so I didn’t have to use as much paint. In trying to plane everything flat I shaved the paint right off in sections. The neat byproduct of that is some really cool looking shavings. I have one last test up my sleeve. The acrylic paint coats well, but does not build up consistently. I will try taking a rounded bit and make deep pockets. These will get a good but thin coating of paint. I can shave or sand plenty off the top with out worrying about going too deep. Assuming the surface finish of the paint is ok, this should be a good solution. More results to follow! After royally screwing up the inlay sign I made a few posts back I decided it was time to experiment with different inlay techniques. I had mixed success, but will share my current round of results here. I started by milling some test shapes into a block of maple and sealing them with a few quick coats of spray lacquer. I thought I had a picture before applying any inlay, but apparently I do not. There is a section for each inlay technique. Each section is made up of 3 letters. The left most letter is 25mil deep, the center is 20, and the right one is 15mil deep. I wanted to see how shallow I could go and still have the results turn out well. My first observation is that the the castin` craft additive did poorly with both the epoxy and resin. For starters, it took a decent bit to get a good looking black. I was worried about adding too much, and you can see the polyester section is fairly translucent. Both were very soft and gummy. Attempted sanding mostly just pulled them out of their inlay pockets. This is really disappointing. I bought a few different colors of the castin` craft stuff which I don’t know what to do with now. On top of that, I bought a container of polyester resin and don’t know what to do with that either… I really thought that was going to work. There are a few bright spots. The inlace material looks great! It is pricey, but at least it works. The acrylic was promising. The picture looks bad because I over sanded it. Looking at the first picture, I barely put any acrylic paint down, just enough to cover the wood. The surface texture looked bad, so I tried sand the paint smooth and got too aggressive. Acrylic paint is a good option if I can get it to look smooth. It is easy to get ahold of, comes in lots of colors, and is color mixable. My next test will be to figure out how to apply paint thick enough so that it can be sanded to look smooth. 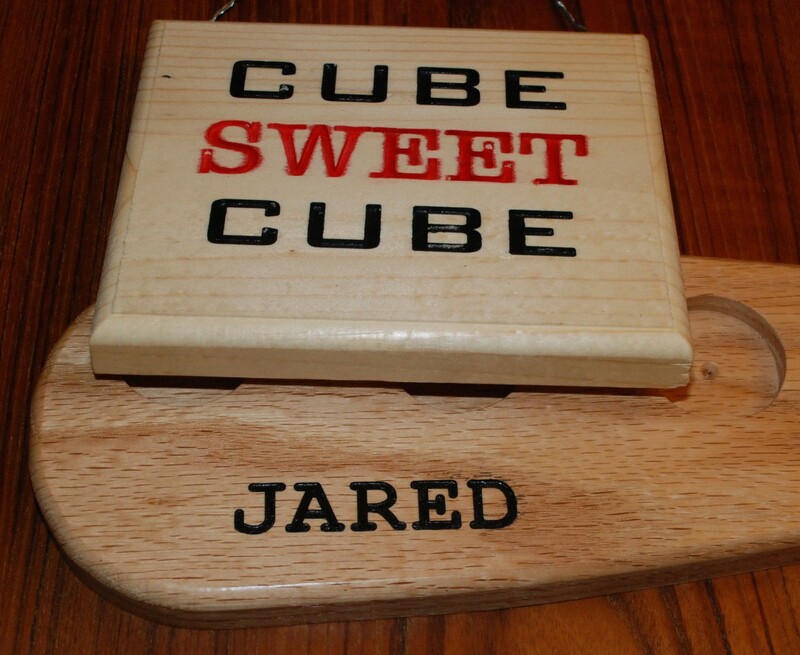 The plan was to make a small sign that said “CUBE sweet CUBE” for a friend/co-worker and myself. I was going to mill some lettering into a nice piece of wood, and fill the pocket with colored inlay resin. I will introduce the mill in a post soon. Until then, I want to share a complete screw up I had. I started by re-sawing (Cutting in half length wise. It turns a thick piece of wood into two thinner pieces of wood) a scrap piece of maple. Some quick sanding got the tops flat and ready to go into the mill. A 0.063″ mill bit did a great job of removing material where the text will be. I sprayed both pieces with a quick coat of lacquer to keep the dye from soaking in along the grain. With the woodworking over, I moved on to filling the text area with a colored epoxy resin. I taped off the area to be filled with black and mixed up the product. The inlay filler I used is a resin with dye made by Inlace. I metered out an ounce of the black resin and put in the proper amount of hardener. After a good mix I poured it into the “CUBE” letters and let it sit. There was a bit of shrinkage, but the results seemed ok. Next I switched to the “sweet” area and mix up the red resin with a proper amount of hardener… or so I thought. 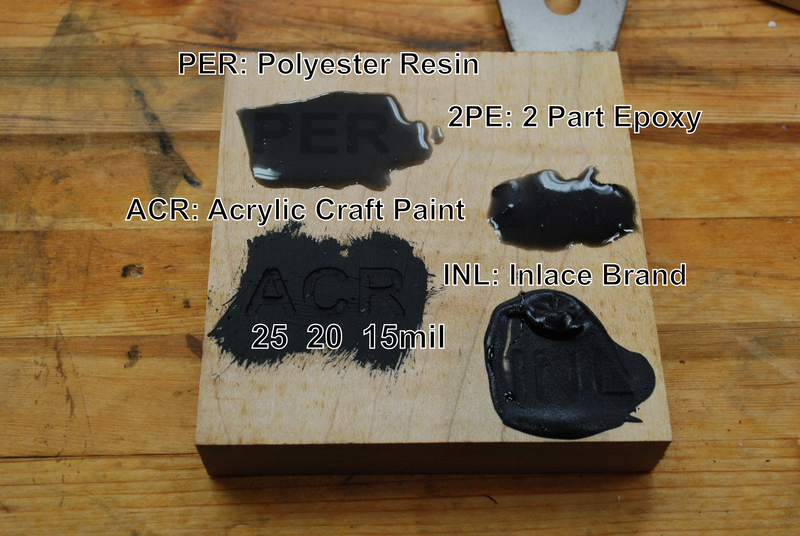 It turns out that the black I got was both resin AND dye pre-mixed together. The red, was just dye. It is supposed to be added to clear resin. 12 hours later, It is still liquid, and I am sad. I can’t come up with any good way to wash out the offending dye. I think this is going to have to be a do-over project. In retrospect, the lettering is a lot deeper than it needs to be. A big waste of resin. Unfortunately this stuff is hard to get. I can’t find it in town, and no one online carries inlace’s full product line. I might try to find their clear resin and do it over, or I might try someone else’s epoxy dye that is more attainable. Oops, the red is not cured!